You could always try Birkenhead Transport Museum. Either visit or call on 647 2128 .See if anyone is left there to give information. The reason I say, is that there used to be a Heritage Trail, which incorporated trams, ,Edgerton Bridge etc and those guys had an amazing amount of information at their finger tips. Also because they all knew each other and passed on interesting stuff. Last edited by granny; 7th Jun 2017 10:04am. Egerton Dock, is in Birkenhead, Wirral Peninsula, England. Named after Sir Philip de Malpas Grey Egerton who laid the foundation stone in October 1844, the dock was completed in 1847. This was just prior to a suspension of the dock scheme, due to a financial crisis affecting the Dock Company. The dock was originally accessible to shipping from the Great Float and via the Morpeth Dock. Here we see a general view across this now disused dock. 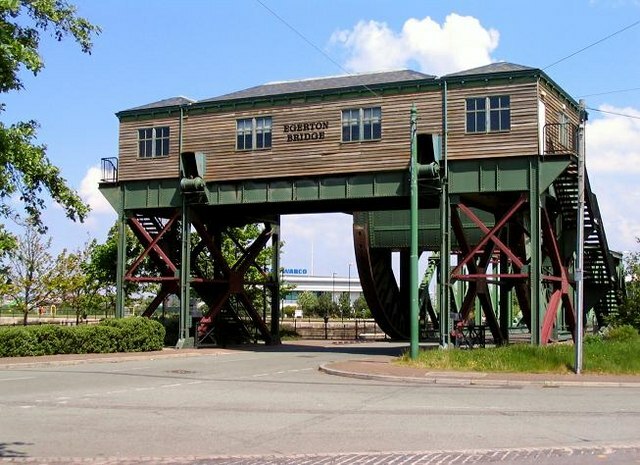 Egerton Bridge is a Bascule Bridge which is well worth the visit, located within Birkenhead dock system, Birkenhead, Wirral, UK. It is an unusual bridge over the road between two docks. It is situated between Egerton Dock and Morpeth Dock and is a working example of a bascule bridge. It was built between 1928 and 1931, as one of four similar bascule bridges in the Merseyside docks, replacing an earlier swing bridge. The bridge and the machine house were completely restored in 1993 and opened to the public in 1995. The word Bascule is French for see-saw. You can climb up to enjoy the view, and there is an audio-visual presentation to see. The word Bascule is French for see-saw. It's had a bad time this bridge. Some years ago it was undergoing refurbishment, and the gearing, racks etc had to be removed. Some bright spark decided to store them temporarily in a skip. Yes, you can guess what happened. Skip contents = scrap, so the whole lot went off to the scrapyard and thence to a blast furnace in China. There were no drawings, so the whole lot had to be expensively redesigned and manufactured. It's no longer really very historic in that respect anyway. I think most people using the road would prefer something a bit quicker. Hopefully the new bridge will be, but I wouldn't put money on it! I disagree about it being 'lovely' by the way. It has always struck me as rather an ill-proportioned and ugly building but in any case I don't agree with maintaining things simply because they are old.I don't want to live in a museum. Good luck with your research on it though. Last edited by Excoriator; 7th Jun 2017 12:25pm. The bridge opened and closed remarkably fast, the slowest part by far is the ship going through together with a safety margin on the opening. Sometimes it wasn't lining up on closing and they had to faff around a bit which took some time. With the money and time spent on the bridge in recent times it is amazing that they are now replacing it. Probably the same old greed scenario, the money is available so they are going to use it and justify it whether it is the best option or not. A lot of wasted money over the years. I think Edgerton Bridge was set on fire, and broken into a couple of times. There was also, Pacific Road Theatre, Wirral Museum at the Town Hall, Historic Warships, Pumping Station, Antiques Triangle, extended Tram Line, all having money thrown at them, but the money was from Europe, so instead of being careful they wasted it, because I assume they thought the money would keep on coming. Disgusting in my opinion and a terrible waste. Annoyingly any European Grant (or Lottery) application has to show sustainability, ie what will keep it going after the grant work is finished. Merseyside seems to specialise at throwing money at things then letting them go to rack and ruin again. I remember seeing some information on the new bascule bridges many years ago whilst doing some research in Liverpool Corporation records. As Birkenhead Docks formed part of the Port of Liverpool they were actually installed by Liverpool Corporation as part of one of several Unemployment Relief Schemes that were undertaken in the early 1930s to provide work for men on Merseyside who had lost their jobs owing to the Depression. A little bit of historical info about the Bascule Bridges.My Father was born and bred in Seacombe.He recently passed away aged 88.He told me many stories about the area but one in particular is quite interesting.After the evacuation of Dunkirk in 1940 many French soldiers were also brought back along with the 330,000 or so British and commonwealth troops.Some of these French troops ended up on the Wirral and we're given the duty to guard the four bridges in case of enemy attack.Every morning they would March along the Dock road in their distinctive blue uniforms followed by the local kids parading behind them,one of which,was my Dad.